Setting ambitious goals seems to be part of Apple's culture, but speaking about such goals publicly before the team has reached them – or before they even know how to reach them – is very different from the company's norm. 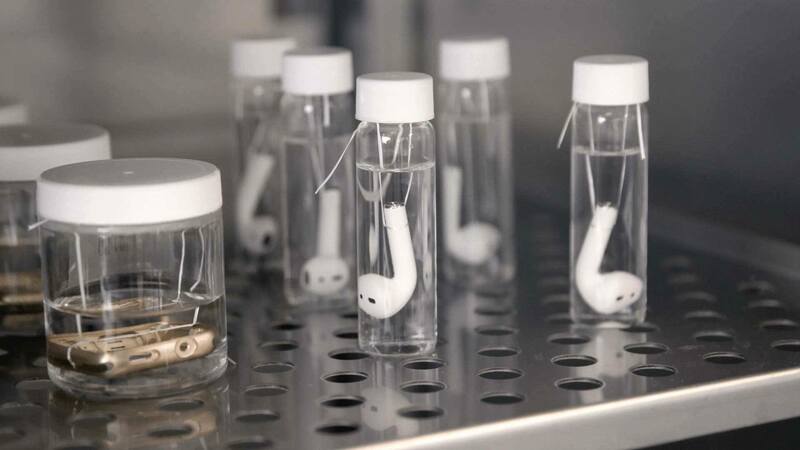 VICE's photo of AirPods and Apple Watch cases in artificial sweat. Aside from this announcement, the piece also features interesting details about some of Apple's other environmental efforts. One of the stranger tidbits is that Apple soaks certain products in synthetic human sweat to test their durability over time – a fact also highlighted in the company's new environmental videos.